« Older: Google Helpouts Update: People like it, so how do we scale this up? 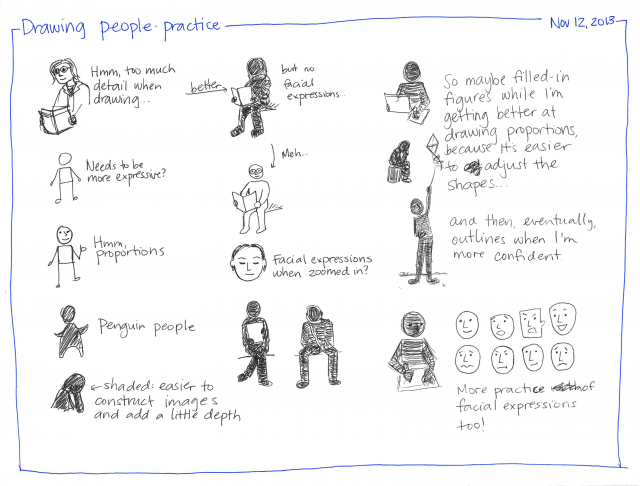 Other people’s sketchnotes can be intimidating. People draw so well! They use colours! They have creative layouts! If you were waiting for permission to start, if you were waiting for permission to draw simple notes, here it is: It’s okay. I don’t focus on the artistic aspect when I draw my notes. Sure, I’ll deliberately practise techniques and work on expanding my visual vocabulary from time to time, but I want to spend more time learning than worrying about drawing. So instead of thinking about composition and creativity, I focus on the kinds of things that make it easy for me to draw what I’m learning and to get back to them afterwards. Ease: I cut out anything that gets in the way of thinking. This is why I tend to add colour after I draw (if at all), I don’t add fancy flourishes, and I usually publish first drafts instead of endlessly refining my drawing or layout. 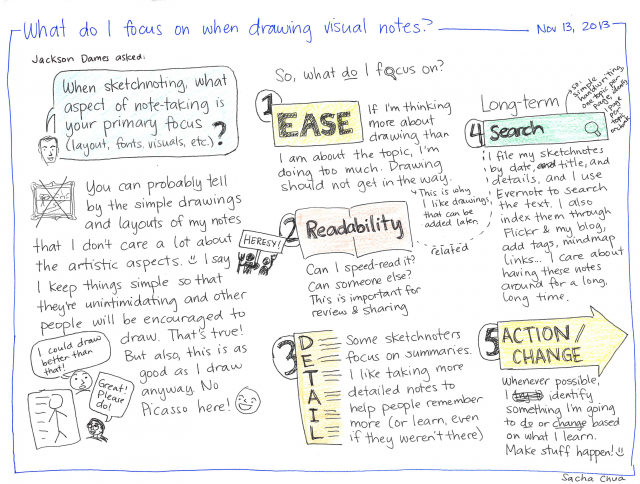 Readability: I want to be able to speed-read my sketchnotes, and I want other people to find them readable as well. So I try to write clearly, horizontally, and in block letters, avoiding script or hard-to-read lettering. Detail: I write more detailed notes than many sketchnoters do. I want my notes to save me from having to reread the book or re-watch the presentation unless I want an exact quote or list. I also want the notes to share all the key points even with people who haven’t seen or heard the source material. I figure we can always make a summary later on, but it’s hard to go the other way around. Search: I also optimize for long-term search and storage. I keep my handwriting neat and easy for computers to read. I invest time in updating filenames, adding tags, and publishing my notes in various places and backing them up. I want my notes to be available for the long term and for as many people as possible. Action/change: When I take notes for myself, I want to make it easier to do something about what I learn. What will I do or change based on the thought I’m exploring, the book I’m reading, the presentation I’m listening to? That way, I’m not just passively recording information, I’m using it to make stuff happen.